Joel Embiid returned to help the Philadelphia 76ers past the Indiana Pacers in the NBA on Sunday. 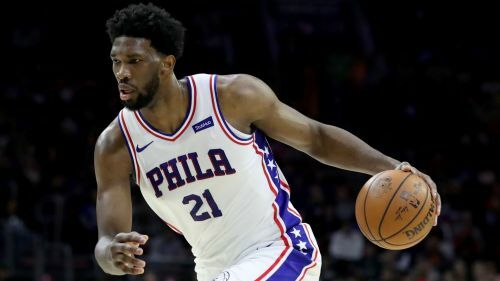 The All-Star center had been resting a sore knee since the All-Star break, but returned from his eight-game hiatus, helping Philadelphia to a 106-89 victory. Embiid racked up 33 points and 12 rebounds on 11-of-21 shooting in 28 minutes. He led all scorers in the contest. The Pacers were led by Bojan Bogdanovic, who totalled 18 points. The win moved the 76ers ahead of the Pacers into third place in the Eastern Conference. Both teams are 42-25, but Philadelphia hold the tiebreaker thanks to their 3-1 lead in the season series against Indiana. "I just felt like I had to play this game just to make sure we were in good position,'' Embiid said (via ESPN). Blake Griffin's 28 points, six rebounds and five assists led the Detroit Pistons past the Chicago Bulls 131-108. D.J. Augustin managed six points on two-of-10 shooting in the Orlando Magic's 105-97 loss to the Memphis Grizzlies. Kelly Olynyk scored one point on 0-of-eight shooting in the Miami Heat's 125-104 loss to the Toronto Raptors. Derrick Jones Jr. got ridiculously high to convert an alley-oop from Dwyane Wade. John Collins came up with a big block and ran 94 feet to finish with a powerful slam in the Atlanta Hawks' 128-116 victory over the New Orleans Pelicans. Luka Doncic showcased his defensive prowess by swatting Clint Capela's shot off the backboard in the Dallas Mavericks' 94-93 loss to the Houston Rockets. Los Angeles are riding a four-game winning streak and are trying to hold onto a playoff slot. Boston have won three straight and seem to be correcting some of their chemistry problems. Only one team can remain hot moving forward.